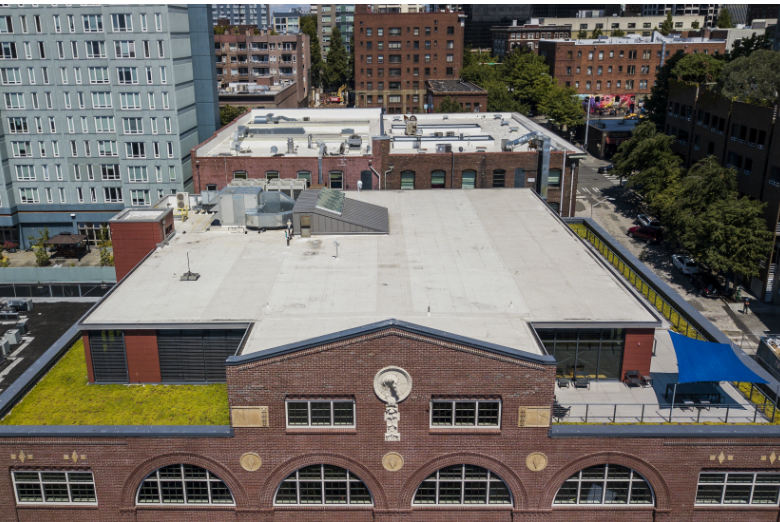 Image Credit: Lease Crutcher Lewis; The green roof on the Union Stables building in Belltown. Momentum for “green roofs” is growing in downtown Seattle, moving the city toward a more sustainable and affordable future, and creating inviting natural areas in the places that need them most. A green roof is a contained natural space atop a man-made structure such as a house, building, or parking garage, which is planted to partially or fully cover the top surface of a structure. Green roofs incorporate plants into a drainage system and help filter the water. Some low-maintenance green roofs, such as on the Park Place building in Downtown, have a thin layer of soil for hardy grasses or succulents. Others incorporate full gardens with a thicker soil depth and can be used for agricultural purposes. Green roofs work by absorbing precipitation, which mitigates the building’s stormwater runoff while also providing temperature insulation to the building below. A prime example of this innovative technology in action is Union Stables, a historic Belltown building, originally home to 300 horses used to pull streetcars and fire engines. It now houses businesses that contribute to a thriving neighborhood economy, all with LEED Gold certification, thanks to its extensive renovations in 2015. Along with other efficiency upgrades, the building has a green roof that reduces stormwater flows and contributes to the overall 70 percent reduction in energy use. While Union Stables maintains its old-world charm, these modern improvements complement its historic significance. Similarly, the Park Place building in Downtown Seattle is an example of how a renovation can help a building owner’s bottom line: succulent plants grow on the building’s roof and help capture rainwater that is then reused in toilets, urinals, and the irrigation system. By repurposing the rainwater that naturally falls on the roof, the building receives sewer drainage credits and reduces water demand, contributing to significant cost savings on their utility bill. These features also helped Park Place become Seattle’s first existing building to attain LEED-EB Platinum certification. These Seattle buildings and others are pioneers of the green roof movement, which has captured the attention of building owners who want to reduce energy costs, protect urban waterways, improve air quality, and even provide park-like eco-retreats for tenants. Although these roofs require an initial installment investment, in the long run they can save buildings thousands of dollars and limit any negative impact on the environment. Read on for details on how these roofs provide numerous benefits in both the private and public spheres. Seattle rarely needs air conditioning with our mild climate, but when a heat wave strikes, air conditioning for offices can result in sky-high energy bills. With a green roof, the rooftop vegetation maintains a relatively stable temperature, providing extra insulation from hot and cool temperatures, which helps decrease heating and cooling costs. Studies have shown that a six-inch green roof can reduce summer energy demands by 75 percent. Green roofs provide appealing recreational spaces in urban areas where parks are harder to access, which helps improve air quality and strengthens native plant and pollinator populations. Green roofs typically add to a building’s distinctiveness, increase property values and are attractive to new tenants and employees. Lest you forget, Seattle’s long, rainy winters are a challenge because the high level of precipitation flows off paved surfaces, picking up pollutants and dumping stormwater runoff into nearby waterways. Green roofs are well suited for Seattle’s downtown because they help slow the flow of rainwater before it creates stormwater pollution, resulting in better-managed stormwater for the building and healthier waterways. Green roofs can also help mitigate damage from flooding by absorbing excess rainwater. More and more building owners and engineers are considering green roofs to be a smart investment in sustainability and affordability. So why do we not see a sea of green when looking down on Seattle’s rooftops? The upfront costs of hiring a landscape architect and constructing a green roof are one reason; many building owners and businesses are waiting for public incentives to help with the costs of creating a green roof. And, although Seattle’s high levels of rainfall throughout most of the year limit the need for irrigation, during the summer months, dry conditions often require that green roofs be watered. This can present an extra expense and use of water. The Seattle 2030 District, a nonprofit that works to increase sustainability in the built environment, is one group that advocates for the development of policies to incentivize the building of green roofs. An additional focus is taking advantage of necessary roof replacements to conserve on construction costs. --If you want to overcome the initial obstacles in the implementation of green roofs, one strategy is to use modular units instead of a full-cover garden. These units can provide some of the cost-reducing benefits and aesthetic appeal without requiring a full roof replacement. --Green roofs are also a great opportunity to use native plants, showcasing their value in the local ecosystem, and require less watering. --It is always important to keep in mind tenant needs and benefits when considering a green roof - do tenants wish to use the garden as a park or see it from a common area? Is the priority on energy efficiency or on visual benefit, or both? In Seattle, 50-75 percent of precipitation does not get reused or absorbed due to the prevalence of hard surfaces like pavement and concrete. Green roofs are a great, innovative way to use our region’s rainwater as a resource, preventing pollution and repositioning our buildings as valuable resources in our ecosystem. This content is the result of a partnership between Seattle 2030 District, Resource Media and Seattle Business magazine, made possible through funding by Boeing’s charitable giving.